For other uses, see Xiangyang (disambiguation). Not to be confused with Xianyang, Xingyang, or Xinyang. Overlooking Fancheng District from Xiangcheng District on the other side of the Han River. Xiangyang is a prefecture-level city in northwestern Hubei province, China and the second largest city in Hubei by population. It was known as Xiangfan from 1950 to 2010. 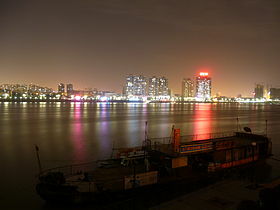 The Han River runs through Xiangyang's centre and divides the city north-south. The city itself is an agglomeration of two once separate cities: Fancheng and Xiangcheng (known as Xiangyang before 2010). What remains of old Xiangyang is located south of the Han River and contains one of the oldest still-intact city walls in China, while Fancheng is located to the north of the Han River. Both cities served prominent historical roles in both ancient and pre-modern Chinese history. Today, the city has been a target of government and private investment as the country seeks to urbanize and develop the interior provinces. In 2017, population of the prefecture-level city was 5.65 million, in which 3.37 million were urban residents. Xiangyang is located at a strategic site on the middle reaches of the Han River, and has witnessed several major battles in Chinese history. Xiangyang County was first established at the location of modern Xiangcheng in early Western Han dynasty and the name had been used continuously for more than 2,000 years until 20th century. In the final years of Eastern Han dynasty, Xiangyang became the capital of Jing Province (ancient Jingzhou). The warlord Liu Biao governed his territory from here. Under Liu's rule, Xiangyang became a major destination of the northern elite fleeing warfare in the Central Plain. In the Battle of Xiangyang in 191 AD, Sun Jian, who was a rival warlord and the father of Sun Quan, founder of Eastern Wu, was defeated and killed. The area passed to Liu Bei after Liu Biao's death. Two decades later, Battle of Fancheng, one of the most important battles in late Han-Three Kingdoms period was fought here, resulting in Liu Bei's loss of Jingzhou. During the early years of Jin dynasty, Xiangyang was on the frontier between Jin and Eastern Wu. Yang Hu, the commander in Xiangyang, was remembered for his policy of "border peace". Cross-border commerce was allowed, and the pressure on the Jin army was greatly relieved. Eventually, Xiangyang accumulated sufficient supplies for 10 years, which played a key role in Jin's conquest of Wu. In Southern Song dynasty, after the Treaty of Shaoxing, Xiangyang became a garrison city on the northern frontier of Song. During Mongol conquest of the Song dynasty, Xiangyang together with Fancheng formed one of the greatest obstacles against the expansion of Mongol Empire. They were able to resist for six years before finally surrendering in the Siege of Xiangyang. In 1796, Xiangyang was one of the centers of the White Lotus Rebellion against the Qing dynasty. Here, rebel leader Wang Cong'er successfully organized an rebel army of 50,000 and joined the main rebel forces in Sichuan. The revolt lasted for nearly 10 years and marked a turning point in the history of Qing dynasty. In 1950, Xiangyang and Fancheng were merged to form Xiangfan City. In later 20th century, it became a major transport hub as Handan, Jiaoliu, and Xiangyu railways intersect in Fancheng. The city's current boundaries were established in 1983 when Xiangyang Prefecture was incorporated into Xiangfan City. The city was renamed to Xiangyang in 2010. 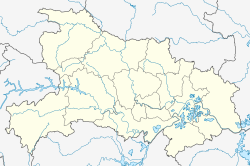 Xiangyang has a latitude range of 31° 14'−32° 37' N, or 154 km (96 mi), and longitude range of 110° 45'−113° 43' E, or 220 km (137 mi), and is located on the middle reaches of the Hanshui, a major tributary of the Yangtze River. The urban area, however, has a latitude range of 31° 54'−32° 10' N, or 29 km (18 mi), and longitude range of 112° 00'−112° 14' E, or 21 km (13 mi). It borders Suizhou to the east, Jingmen and Yichang to the south, Shennongjia and Shiyan to the west, and Nanyang (Henan) to the north. Its administrative border has a total length of 1,332.8 km (828.2 mi). Xiangyang has a monsoon-influenced, four season humid subtropical climate (Köppen Cfa), with cold, damp (but comparatively dry), winters, and hot, humid summers. The prefecture-level city of Xiangyang administers 9 county-level divisions, including 3 districts, 3 county-level cities and 3 counties. These are further divided into 159 township-level divisions, including 106 towns, 29 townships and 24 subdistricts. Xiangyang possesses large water energy resources whilst its mineral deposits include rutile, ilmenite, phosphorus, barite, coal, iron, aluminum, gold, manganese, nitre, and rock salt. The reserves of rutile and ilmenite rank highly in China. Textile production is the mainstay industry of Xiangyang followed by machinery manufacture, chemical processing, electronics, and manufacture of construction materials. Agricultural resources are significant with Xiangyang's chief farm products including grain, cotton, vegetable oil crops, tobacco, tea and fruit. As the home of Dongfeng Motors, Xiangyang is a well known automobile hub and partners with foreign manufacturers to produce Nissan and Infiniti models for domestic sales. In addition, there are a number of chemical fibre enterprises in the city including Birla Jingwei Fibres, a member of the Aditya Birla Group. The city has also invested in many industrial, technology and clean energy parks. Xiangyang is a railway junction for the Xiangyang-Chongqing (Xiangyu), Hankou-Danjiangkou (Handan), and Jiaozuo-Liuzhou (Jiaoliu) Railways. Three National Highways including Route 207 pass through the city. The Han River and four other rivers are open to commercial transport year-round. The Xiangyang Liuji Airport has commercial airline services to major cities throughout China including Beijing, Shanghai, and Guangzhou. 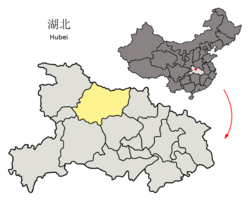 ^ "China: Húbĕi (Prefectures, Cities, Districts and Counties) - Population Statistics, Charts and Map". www.citypopulation.de. Retrieved 5 April 2018. ^ 湖北省襄樊市更名为襄阳市(图). 163.com (in Chinese). 2010-12-02. Retrieved 2010-12-03. ^ "2017年襄阳市常住人口城镇化率达到59.65%". Hubei Statistics Bureau. Retrieved 7 March 2019. ^ "中国气象局 国家气象信息中心" (in Chinese). China Meteorological Administration. Retrieved 2010-05-27. Wikimedia Commons has media related to Xiangyang. This page was last edited on 28 March 2019, at 13:15 (UTC).